The constant growing number of Incrediballs unproportional to the creation of new levels to play made me give up from this game. And getting the seasonal ones forces players to spend a ridiculously high amount of money to get all of them because it is impossible to get them all at once during a seasonal event. They should improve that to incentive people to keep playing. Though I confess: Raydoom and Hellen are pretty neat skins. I was wondering if anyone has been able to obtain (Event Only Incrediballs) such as the The C-Weeds or The Sandees through Lucky Golden Tickets or normal gameplay. The game might be glitched/bugged because I get the error msg when trying to use New Creature Elixirs on Surprise Eggs; even though I still need 25 Incrediballs. "You can't use this elixir at the moment because a new creature of the desired rarity cannot be guaranteed." WhiteRing wrote: Now I also lost all the "event exclusive" Incrediballs. The RayWiki says it's possible to get them on golden tickets, but that must be ultra rare. Anyone here ever had such luck? I have tried scratching over 40 lucky golden tickets but not had any luck. New creature elixirs can only be used on Incrediballs which can be obtained from completing adventures. The event exclusive ones can only be obtained from Golden Lucky Tickets once the event is over. However, I am starting to think this system is glitched. Several event exclusive families don't even appear on the tree for me and the ones which do I have never been able to get no matter how many Golden Lucky Tickets I have scratched. I've seen many others with the same issues. I tried contacting Ubisoft Support but just got a generic respons. I eventually got them to send the report to the dev team, although that was a while ago and I haven't seen any changes yet. I've been wondering for a while whether to ask you this or not... but here it goes, it never hurts to ask. It might even be a useful thing for the wiki. I'll do my best do explain... but please do not be offended if I explain too much and ignore it if it's stupid. I've been "working" on a little project since the day the social sharing functions have been implemented in the game: collecting all the awesome photos/portraits of the Incrediballs and costumes, in the highest quality possible. As you probably know, when we share an image on Twitter or Facebook, It undergoes a compression process to make it load faster, but this creates compression artifacts that blur the image. As to get these images of the game we need to share them in social networks, it is difficult to avoid this loss of quality. 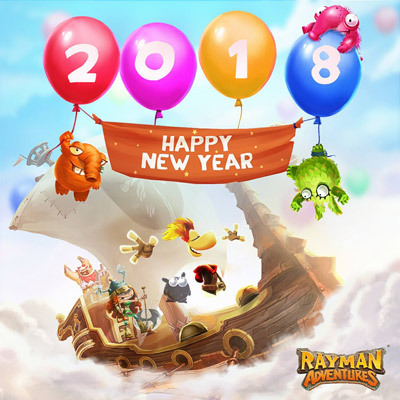 Throughout the updates some modifications have been made, but currently there are two versions of all the images: the Twitter version and the Facebook version. The Facebook version is now shared as a link to the original file, so it retains the original quality (at least on Android). The Twitter version in now only available on iPhone, so I'm not sure how it works there (as I play on Android). When it was available on Android, I was able to get the original file by saving it to the device via the Twitter app, right after sharing. If it was on a different device (PC, for example), it already had that awful compression. It may work the same way on iPhone. Having said that, as you may also be collecting these images, we could join forces and, together, get them all in high quality. Unfortunately, most of the images posted on the wiki aren't the original file but the compressed version, so I think it would be nice to replace them with the better quality versions (and add the Facebook versions as well, since they are quite different). I think they deserve to be preserved. However, I don't know what is the best way to do this. As you can see, I already have the vast majority of the original files (feel free to download what you want), but I'm still lacking some (I can no longer get the Twitter versions and missed some of the seasonal Incrediballs). I hope this is not a stupid thing that only I care about. If you are interested, I can even do a spreadsheet to keep things organized (the costumes is the most complicated part because no one has them all... I think). Last edited by WhiteRing on Mon Nov 27, 2017 12:42 am, edited 1 time in total. All the Incrediball images on the wiki which I've uploaded are ripped directly from the game and are 1024 x 512. I can some day go through the ones which are compressed and replace them with the original ones. You're always welcome to replace them yourself if you've got better quality ones. As for the Facebook versions, I don't think they exist within the files (or at least I can't find them). Since they do have some minor differences I think it'd be good to have them on the wiki as well. Yes, your uploads are great, but very few of the families were uploaded by you (or I did not find them). And you're right, the Facebook versions don't exist within the files. They're stored on a server and what is shared is a link to that file. So, when it comes to Facebook, there is no quality loss. The only challenge is getting all the families and costumes. Regarding the files you ripped directly from the game, I noticed something strange. There are no traces of compression artifacts, which is great, but they have some kind of "aliasing". Also, as the twitter version has the name of the character, do you think it makes sense to have both versions on the wiki? Last edited by WhiteRing on Mon Nov 27, 2017 12:41 am, edited 1 time in total. Yeah, you're right. I think the in-app files might just be used for the preview that's shown in the game, which is why the quality isn't that great. We should definitely use the ones you've collected when we can since they retain the original quality the best. As for getting all photos, I know that Brad has been buying most (if not all) costumes in the game. I'll ask him if he can help out with this project. As for the name being on the picture I don't really think it matters. But if we can get both I guess we should. This game is online-only, so when the servers eventually shut down it will be lost forever. I'd prefer to save as much from it as possible before that happens. Carrot-master wrote: Yeah, you're right. I think the in-app files might just be used for the preview that's shown in the game, which is why the quality isn't that great. It makes sense, because the preview also doesn't have the name and logo. Although they are not perfect, that version is much better than the the ones with compression artifacts. As for getting all photos, I know that Brad has been buying most (if not all) costumes in the game. I'll ask him if he can help out with this project. The good thing about the costumes is that we don't need to buy them to share the photo, as long as they're available on the store. The bad thing is that A LOT of them are "limited edition" and, if you did not buy it, you will probably never see it again. I have been collecting them for some time, but I have mostly the Facebook versions because I'm on Android. Tell him about de trick to retain the quality of the image (save the image directly in the twitter app). This game is online-only, so when the servers eventually shut down it will be lost forever. I'd prefer to save as much from it as possible before that happens. That's exactly my concern. And even without the servers down and the game dead, nothing guarantees that another infamous update will not be released and all our progression lost. So it's better to do this sooner than later. Ill do the same for the Costumes and keep it always updated. EDIT: Actually, looks like I still don't understand how the wiki works. For example, if the file is a JPEG, it doesn't let me replace it with a PNG. What should I do? If you've got any wiki questions you can ask me on my talk page. As for the file format, it needs to be the same for you to replace them. So if the file format is different you'll have to upload a new version of it and I'll delete the old one. I'll take a look at your spreadsheet tomorrow and see if I can contribute in some way. Thanks for helping out with this! I just finished organizing everything. I'll keep the files updated as I get more pictures or more Incrediballs/Costumes are released. This is just to keep things organized between us, because the idea is to upload everything to the Wiki. The language is very ambiguous but, in my understanding, it implies that we get the whole family with the purchase, which would be of great value... but at the same time I really don't believe it. 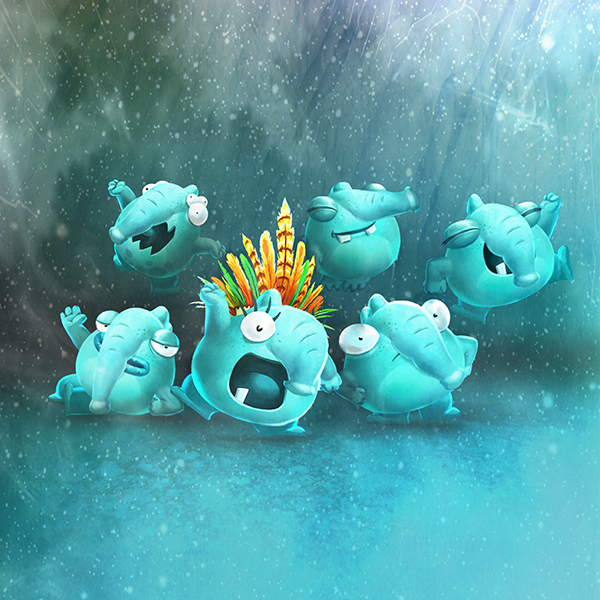 It is certainly identical to the "New Creature Pack", only with the difference of knowing immediately which type of Incrediball you will get. I really miss the Bon'Bons, which I lost along with my save, so it's very curious to be the family that I saw right away. Anyone bought that pack already and know how it works? I've been curious on that as well. I'd assume it's all creatures in the family, though the description is very vague. I got the Bon'Bons today as well, so I guess it's the same for all players which family it is each day (assuming it appears each day like the name would suggest). Also, I was checking through the files and noticed that besides the hunts, endless challenges and spin-wheel events there's a fourth one mentioned called "armevent". Any idea what this could be? It seems to have been there a while now and doesn't really contain much at all. Might be an upcoming feature since I usually find those in the files way in advance. I have no idea, but let's hope it's something doable that doesn't require spending tons of real money. 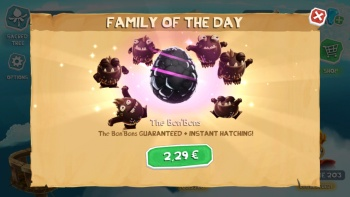 About the family of the day, I'm almost sure that it's not the complete family because it has the same price as the "New Creature Pack", which is still available. Who would want to buy only one when you can buy them all for the same price? It doesn't make sense, unless they're trying to fool the distracted on purpose. 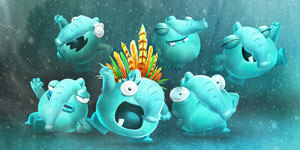 @WhiteRing I bought the $3 Special Pack to test if that was the case, however you only get (1) Incrediball from the Bon'Bons Family so its exactly as you described; same as the New Creature Pack but with 100% chance for that particular family. I still hadn't had any "luck" getting the Golden Ticket Families after their latest update (v3.0.0), so I thought I'd give it a shot. It seems ubisoft simply refuse to fix this bug despite knowing about it for ages, thus leaving many players with incomplete families and not much incentive to play. The New Frost-Bites Family is kinda cool though, and gives you (7) new incrediballs through normal adventures. hanothemano wrote: The New Frost-Bites Family is kinda cool though, and gives you (7) new incrediballs through normal adventures. Yes, they really are a bunch of super cute snow leopards! By the way, does anyone know how to get "Freeze Ray"? I haven't seen him anywhere. Last edited by WhiteRing on Mon Dec 25, 2017 10:42 pm, edited 2 times in total. He appeared the first day in a pack, but I haven't seen him since... No clue why. Edit: The pack just appeared again. I'm guessing it's random. It says I can use a controller to play it so I wonder if that would give full control over the player just like Legends. I have to try it out later. Controller gives you more or less full control. You can't decide if you want to run or not though since that's automatic. If I remember correctly, ground pounds are also easier to perform.